Made out of steel or aluminium, driveshafts on rear wheel drive vehicles are responsible for delivering the power of the engine through the transmission output shaft through the differential in the axle to Constant Velocity joints (CV-joints) and onto the drive wheels. 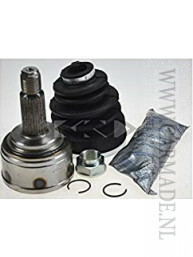 Front wheel drive vehicles use frontal driveshafts usually referred to as half shafts. If you car is shuddering, vibrating, clunking or squealing then you may have a driveshaft problem. Driveshafts can also be damaged by kerbing wheels or not replacing cv boots when worn.